Oklahoma City Thunder defeated Bucks to seal sixth in West, Spurs win to seal No 7 seed, Clippers take eighth seed and will face Golden State Warriors in the first round of playoffs. Jamal Murray hit a go-ahead three-pointer with 31.5 seconds left as the host Denver Nuggets scored the final 15 points of the game to beat the Minnesota Timberwolves 99-95 on Wednesday night to earn the No 2 seed in the Western Conference. The Timberwolves led 95-84 when Reynolds hit his fifth three-pointer with 4:02 left in the game. Denver struggled all night to hit shots but heated up. Jokic hit a short jumper, Will Barton drained a three-pointer and then split two free throws to make it 95-90 with 1:57 left. Dario Saric missed on the other end and Paul Millsap hit another three-pointer with 1:30 left to pull Denver within two. The Timberwolves missed two straight shots and after Millsap tipped Barton's missed three-pointer to Murray, he calmly drained one from long range to put Denver ahead 96-95. Jokic hit two free throws and Millsap one to close it out as the Timberwolves missed their last eight shots. Dennis Schroder scored 32 points to help the Oklahoma City Thunder earn the No 6 seed in the Western Conference with a 127-116 win at the Milwaukee Bucks on Wednesday night. The Bucks, who had already sealed the top seed in the Eastern Conference coming into the game, sat Giannis Antetokounmpo, Eric Bledsoe and Brook Lopez to rest them ahead of the playoffs. 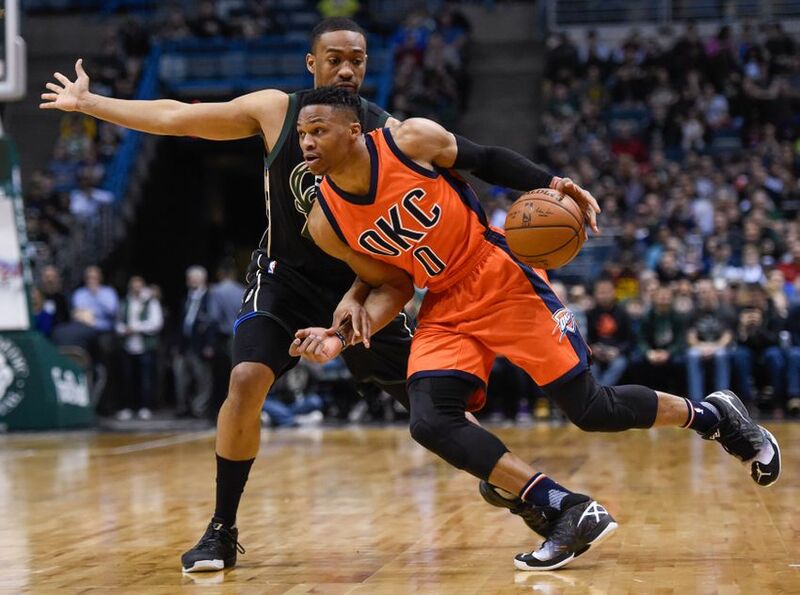 While the Bucks had little to play for in the regular-season finale, the Thunder had plenty at stake coming into the game, with their playoff spot to be decided between the sixth, seventh and eighth seeds. The Thunder took care of that, taking control of the game with 39 points in the second quarter and then maintaining that lead the rest of the way. That quarter included a 16-0 run that featured four three-pointers. Playing without Paul George, who hit a game-winning shot the night before against Houston, the Thunder leaned heavily on the three-ball with Schroder in the starting lineup in George's place and the Bucks spending much of the game in a zone defense. Oklahoma City hit a franchise-high 23 three-pointers. Schroder hit a career-high eight from downtown, going 8-of-15 from long distance. Russell Westbrook finished with 15 points, 11 rebounds and 17 assists for his fifth triple-double in six games. He tied Magic Johnson for second all-time in career triple-doubles with his 138th. Jerami Grant had a career-high 28 points for Oklahoma City. Tim Frazier, making just his second start with the Bucks, had a career-high 29 points, making 4-of-6 from behind the arc. Bonzie Colson and Khris Middleton scored 21 each for Milwaukee. LaMarcus Aldridge poured in 34 points and took 16 rebounds to help propel the San Antonio Spurs to a resounding 105-94 win over the visiting Dallas Mavericks in the regular-season finale for both teams. The win was San Antonio's third straight and - combined with the Oklahoma City's win over Milwaukee - earned the Spurs the seventh seed in the NBA playoffs against either Denver, Portland or Houston. It was also the final game in the 21-year career of Dallas forward Dirk Nowitzki, who announced his retirement on Tuesday after the Mavericks' final home game. Nowitzki led Dallas with 20 points in the contest and pulled down 10 rebounds in 31 minutes of play before leaving the court for the final time with 47 seconds remaining. Dallas, playing the second game of an emotional home-road back-to-back, had a two-game winning streak snapped and ended the season at 33-49. The Mavericks will miss the postseason for the third straight season. The Mavericks trailed by 18 points in the first minute of the fourth quarter but reeled off a 13-0 run, capped by a three-pointer by Courtney Lee, to pull within 83-78 with 9:28 to play. San Antonio reassumed control, however, by scoring the ensuing seven points and finished off the Mavericks down the stretch. DeMar DeRozan added 19 points for the Spurs (48-34), who finished the regular season with one more win that they had in 2017-18. Derrick White and Bryn Forbes added 14 and 10 points, respectively, for San Antonio, who have earned their NBA-record-tying 22nd straight trip to the playoffs. With the win, Spurs coach Gregg Popovich tied Lenny Wilkens for the most total wins - regular season and playoffs - by any coach in NBA history with 1,412. Rookie Anfernee Simons scored a season-high 37 points to lift the Portland Trail Blazers to a come-from-behind 136-131 victory over the visiting Sacramento Kings. Skal Labissiere added 29 points and 15 rebounds for the Trail Blazers, who trailed by as many as 28 points in the first half. Jake Layman, Meyers Leonard, and Gary Trent Jr scored 19 points apiece for Portland (53-29), who gained the No 3 seed in the Western Conference and will face No 6 Oklahoma City (49-33) in the first round of the playoffs. The Blazers finished tied with the Houston Rockets (53-29) but won the head-to-head tiebreaker. Marvin Bagley III led Sacramento (39-43) with 20 points off the bench. The Blazers cut the deficit to 113-98 after three quarters and used a 24-4 run to take a 122-117 lead with 5:45 remaining. BJ Johnson scored for Sacramento, but Layman answered with a layup to make it 124-119 with 4:27 to play. Simons knocked down a corner trey to give Portland a 131-123 lead, but Mason answered with a three-pointer to make it 131-126 with 1:55 left. Simons then scored on a one-handed follow to give Portland a 135-131 advantage with 48.7 seconds to play. He split a pair at the line to make it 136-131 with 21.8 ticks left. The Memphis Grizzlies surprised the visiting Golden State Warriors on the eve of the playoffs, parlaying a remarkable 86-point first half into a 132-117 victory in both teams' regular-season finale. The loss had no bearing on the playoff seeding for the Warriors (57-25). The two-time defending champs will enter the postseason as the top seed in the Western Conference, paired with the eighth seed in the first round that begins this weekend. The win allowed the Grizzlies (33-49) to avoid what would have been a second straight 50-plus-loss season. Rookie Jevon Carter scored 19 of his career-high 32 points in the first half, during which the Grizzlies ran off to an 86-68 lead. Justin Holiday, a former Warrior, had 20 of his 22 points and Bruno Caboclo 16 of his 21 in the first 24 minutes, during which the Grizzlies shot 61.7 percent and went 14-for-23 on three-pointers. Memphis finished 21-for-46 on threes, outscoring Golden State 63-39 from beyond the arc. Carter, known as a defensive specialist as a collegian at West Virginia and a second-round pick last June, had never previously scored more than 15 points in an NBA game. He came off the bench to hit all five three-pointers he attempted in the first half and 8-of-12 for the game. Playing only the first half, Kevin Durant had 21 points and Klay Thompson 19 for the Warriors, who sat out Stephen Curry one night after he sustained what was labeled a mildly sprained foot in a win at New Orleans. With nothing at stake, the Warriors also chose to rest Draymond Green, DeMarcus Cousins, and Shaun Livingston.